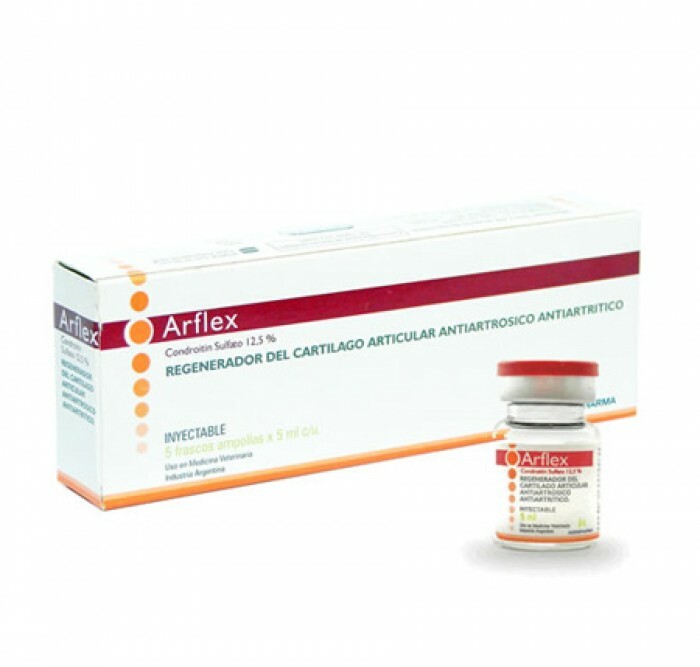 Regenerator of articular cartilage. Injectable. 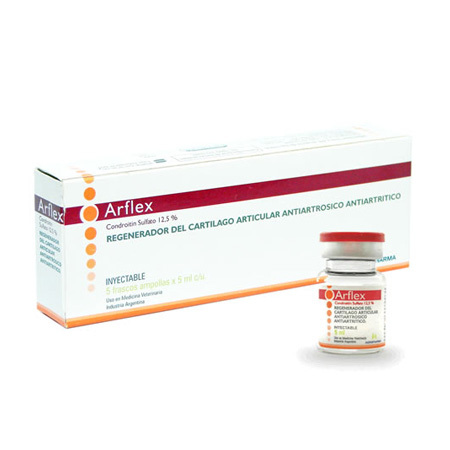 Indications: Antiarthrosis, antiarthritic. Noninfectious arthritis. Hydrarthrosis. Osteoarthritis and other degenerative pathologies. Chondromatoses. Tendonitis. Synovitis. Coadjuvant in the treatment and prevention of osteo-articular pathologies. Coadjuvant in repair of fractures post-osteoarticular surgery. Osteochondrosis. Anti-inflammatory joint. 1 to 5 kg; 0.5 ml. From 5 to 10 kg; 1 ml. 10 to 20 kg; 2ml. 20 to 30 kg; 3ml. Apply these doses every 4 to 7 days intramuscularly or subcutaneously. The duration of the treatment is based on professional judgment, depending on the type of pathology and the patient's condition. It is recommended to apply a minimum of 8 doses. Given the safety of the product, the doses can be increased and the treatment repeated, according to professional criteria. EQUINES: Administer a dose of 5 ml with intervals of 4 to 7 days. A minimum of 5 applications intramuscularly. The treatment can be repeated according to professional criteria. Exipient csp .......... 100 ml.